As you know, I grew up in the mountains of East Tennessee, and where we live now, in Coastal Virginia, it's... F L A T. Seriously, our highest point is an area called Hilltop which is like 9 feet above sea level. 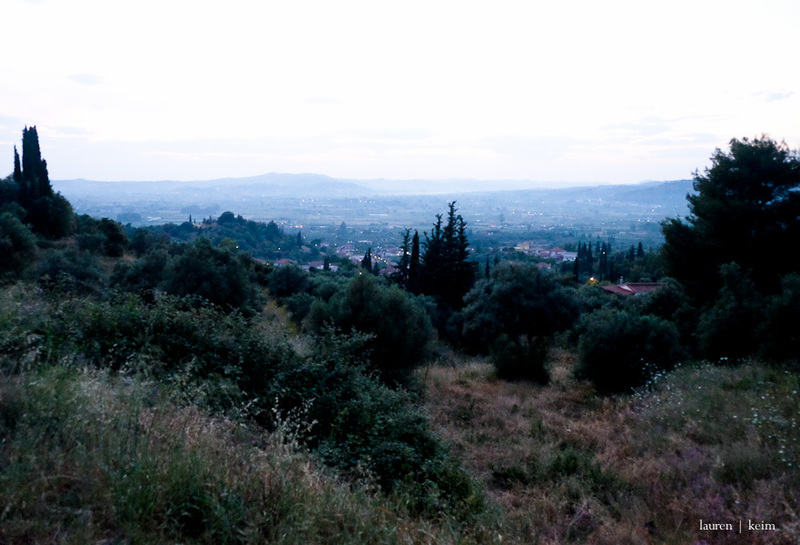 So, it felt really, really lovely to travel the hills of Greece. The bus ride was wind-y and at times terrifying, but it was really lovely. After our trip to Olympia, our group headed high into the hills above the historic site for another lovely dinner. I could do a whole post on our dinners in Greece, actually. They were the best part. I know I've talked before about how the organizers of the conferences go out of their way to find local spots with gorgeous, abundant, authentic food. Emphasis on abundant. Above Olympia the mezze was plentiful: platters of eggplant, lamb, insalata. The food kept coming. And, again, this was all before the entree! The wine was copious and the food more so. And then there was the view. We were perched high on the hillside, looking down into the valley where the original Olympians competed, and as the food came to us in waves, the sun slowly went down and the lights grew brighter and twinkled along the the mountainside. The dinners can be hard too. A lot of science talk. Over our heads a bit for me and Cal. But people start to relax (the wine helps) and the talk flows as freely as the food. Regularly we sit at the table with men and women from all parts of the world. Italian, Swiss, German, French, Iranian, South American, Asian... Really. I could go on and on. So we share things. Like how early (or late) the sun sets. Or how much gas costs. Or who eats lamb and who eats beef. Whose kids start school in September and whose kids go year round. Science fades away for all but a stalwart few as cultural differences, and more importantly, similarities are shared. Cal was taught some snippets of Swedish and Italian, and I taught one woman who spoke no English at all how to use her phone camera and edit a photo. It was great. Because of scheduling issues, this same meeting will be held in the fall next year. If Neel can go (it always boils down to funding), we're torn. It's fall, and right at the start of school for Cal and Neel too) It's hard to miss school, for sure, and still. When I think about what he could gain by traveling to Greece even during the school year, I think about those dinners.